2. 1/3 cup lemon or pineapple juice. 3. 10-ounce pecans, chopped fine. 4. 25 maraschino cherries, chopped coarse. 6. 1-pint heavy cream, whipped. 8. 25 leaves, leaf lettuce, washed. 1. Peel the bananas, cut in half crosswise and dip in the fruit juice. 2. Blend together the mayonnaise and whipped cream. 3. Dip each banana half into the mayonnaise whipped cream mixture, coat thoroughly. 4. Roll into the finely chopped pecans. 5. Place a leaf of lettuce on cold salad plates. 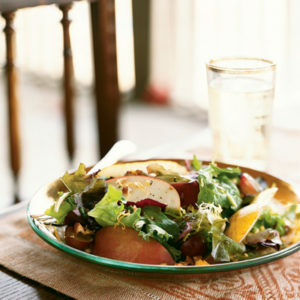 Sprinkle shredded iceberg lettuce on the leaf lettuce. 6. Place the banana halves in the center of each plate and sprinkle on the chopped maraschino cherries. 7. Serve with a small mound of dressing and a sprig of parsley. 1. pear halves, canned, small, drained. 2. 3 Pounds cottage cheese. 3. 25 red maraschino cherries, with stem. 4. 25 leaves of lettuce, washed. 1. Place a leaf of lettuce on cold salad plates. 2. Cut the iceberg lettuce into quarters and shred. Sprinkle the shredded lettuce on the leaf lettuce. 3. Place a scoop of cottage cheese center of the shredded lettuce. 4. Brush the outside of each pear half with red color and lean two of the halves against the cottage cheese. 5. Place a maraschino cherry on top of the cottage cheese and garnish with a sprig of parsley.